My head got cold and I bought a hat today. I'm not at all certain it's a good hat, but it seems very cleanskies, so I thought I'd post it here. I also accidentally went into the Next sale shop, and found a coat that nearly matched; damiancugley said I looked like a stoker on an airship or a paddle steamer, but I thought I looked more like a member of a surreal service industry. I also thought £29.99 was far too expensive for a coat with no obvious merit. Spoiled by charity shops, clearly. I don't know, do you think it's too much? Later that day: Special offerings of pizza were included for foreign 'spirits'. Nah, it's actually a very nice hat - good cure for gloomy darkness. Wonder if any of your light-coloured glasses would match for even better winter-alleviation? Because that'd help sort out the too-muchness of the hat, oh yeah. For them to become affordable consumer electronics, rather than something you put on expenses. a) was it *really* called Layfest? Or was that a Freudian sheep? b) 2p is too much for a coat if you don't like it and already have something to keep you warm in winter. OTOH if a coat is so flattering and well made that you could and would wear it for years and years, then it's just a question of can you afford it. But it's rare to find a coat that nice (despite all the tosh they print in the Sunday supplements). laptop keyboards, tsk ... my freudian slip is now safely tucked out of sight. No, he didn't --- if the tech defeats you, send it my way and I'll post it for you, if you want. Bum! I couldn't transfer it at all. I emailed Sasa, and asked him to post you a copy, too. It's a nice one. Coats need to be loved as they're dreadfully insecure garments underneath their touch exterior. If you don't love it, you probably won't wear it, and 30 quid would be a waste. However, if its warm, and you're cold and in need of a coat, 30 quid is cheap for a utilitarian coatbeast. ... at least, it wasn't warm compared to the green leathers I was already wearing. 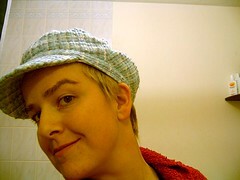 picture of me in my new hat = fab!